MANCHESTER, N.H. (Courthouse News) – Closely watched for his pivotal role in the battle over Supreme Court nominee Brett Kavanaugh, Senator Jeff Flake rallied Monday night in New Hampshire for the return of civility and compromise in American politics. Just three days earlier, following a dramatic hearing at the Senate Judiciary Committee, Flake cast the deciding vote to have the FBI investigate emerging sexual-assault claims against Judge Kavanaugh. 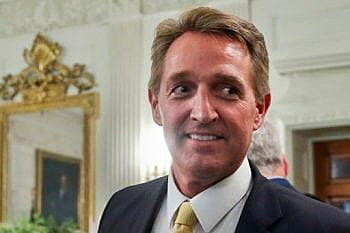 Based in part on his disagreement with how the Republican Party conducts itself under President Donald Trump, Flake announced nearly a year ago that he will retire from the Senate at the end of his term in January 2019. Flake later made a pointed reference to the president’s campaign slogan. “If you want to make America great as an elected official, be humble, conduct yourself in good faith, and when necessary, compromise to find solutions,” Flake said. Compromise was how Flake described his Friday efforts to ensure that the FBI investigate before before the full Senate votes on Kavanaugh. As for how he will vote on Kavanaugh when the nomination is put to the Senate floor, Flake said he will first need to consider what the FBI uncovers. “If the past week has taught me anything, it is that this country is hungry for us to work together again on their behalf,” Flake said. Outside St. Anselm, dozens of protesters waited in drizzling rain to call for the end of a different kind of culture, not of divisive politics but of ignoring women’s stories of sexual assault. “I think that our voices are extremely important, and we need to be heard in a time like this where it feels like the brave survivors that stand up aren’t being listened to or believed,” said Amelia Keane, a 27-year-old Democrat who was elected in 2016 to the New Hampshire House of Representatives. Keane, who is also the Executive Director of the NH Young Democrats, joined the chorus of voices outside calling on Flake to reject Kavanaugh based on the testimony of Dr. Christine Blasey Ford. The visit was Flake’s second trip to New Hampshire this year, stoking speculation about a potential run for president. After the speech, Flake did not rule out the prospect but told reporters that his focus is on his last three months in office.